Analysis of the election data is now trickling in, so I feel I can now make some real preliminary estimates of the degree of fraud (eventually, I will compile a list of estimates as I did for the 2011 elections). 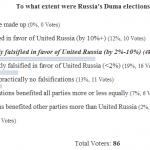 My assessment is that in these elections it was on the order of 3%-4%, which is lower than my estimated range of the 5%-7% fraud in the Duma elections, but still far too high by developed country standards. 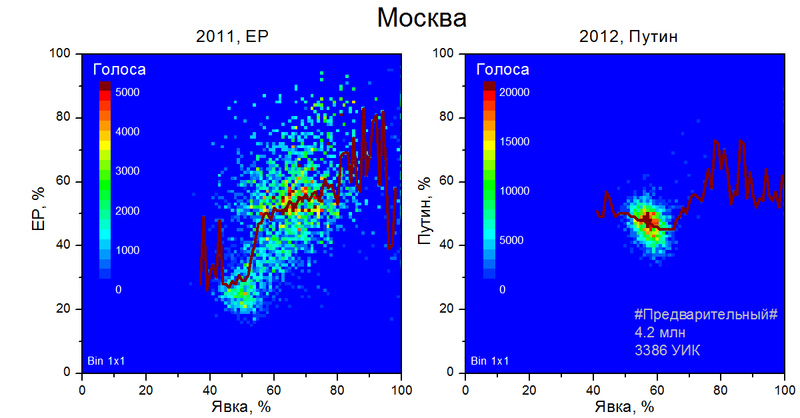 The geographical distribution of fraud has changed significantly: Moscow actually appears to be very clean this time wrong (in stark contrast to 2011, and 2009). However, there were little to no changes for the better in the ethnic minority republics, which is where the great bulk of the falsifications are now concentrated. The most reliable evidence, in my opinion, is the FOM exit poll which gave Putin a vote of 59.3% in contrast to the 63.6% official tally – a difference of slightly more than 4%. (VCIOM gave him 58.3%, but I consider it slightly less reliable: It polled 63 regions, to FOM’s 81, and the missing regions included places like Ossetia and Daghestan where support for Putin is higher than average – even if so is the level of falsifications). Below is a table of regional falsifications, courtesy of Kireev. As you can see, the highest discrepancies between official and exit poll results – and the only ones exceeds the margin of error – are now in Federal Districts with many national ethnic minority republics: North Caucasus (Daghestan, Chechnya, etc), the Urals (Tatarstan, Bashkortostan), and the South (Kalmykia, Adygea). 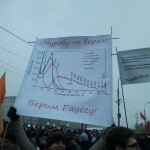 Across Russia as a whole, the discrepancy was 4.3%, relative to 6.3% in 2011. Readers of the blog will know that my assessment is that Moscow was marred by extensive fraud in 2011, with United Russia getting 30%-35% as opposed to its claimed result of 46.6%. Now Putin is always 10%-15% more popular than United Russia, so the very fact that he got virtually the same score – 47.0%, to be precise – in Moscow as did United Russia three months later is damning of the capital’s 2011 elections by itself. But there is also stunning graphical evidence of this, courtesy of Maxim Pshenichnikov. 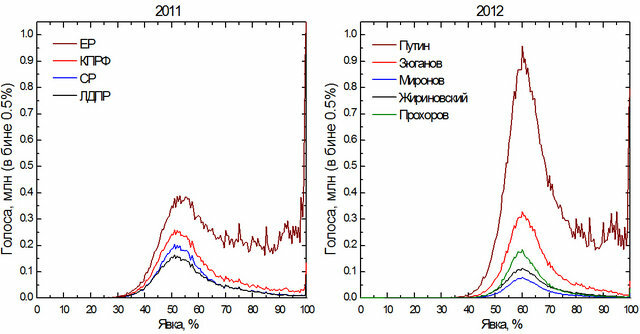 The graphs below show the votes for turnout (horizontal) vs. the votes for UR/Putin (vertical), in the 2011 election (left) and the 2012 election (right). Observe the vast change from two clusters in 2011, with the bigger one around 55% representing stations where there was fraud, and the very tight, elegant cluster around 45% representing the vote for Putin in 2012. Question to everyone who expressed skepticism that there was mass fraud in Moscow in 2011: How would you explain this difference? The ironic thing, of course, is that the cleanness of the 2012 elections implicitly condemn the results of the 2011 elections in Moscow. Nonetheless, its still a huge boost for Putin’s legitimacy, first and foremost because Moscow is the focal point of the protests against his rule. The protesters, at least at their local level, will no longer have a leg to stand on; nor will they be able to be able to parade about with signs like the one below. Moscow trusts in Gauss, so they will now have to trust Churov too as the two now agree with each other. 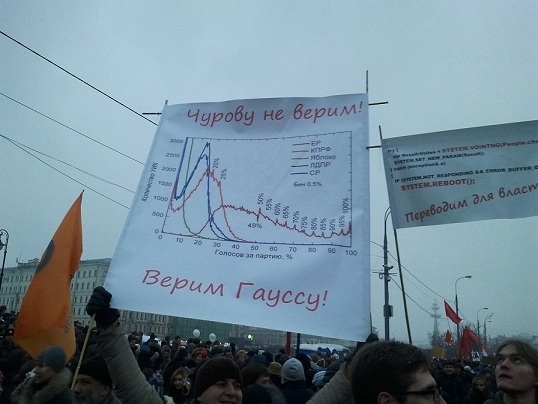 The picture was far worse in St.-Petersburg, with it seeing significant falsifications to the tune of perhaps 5%-6%. 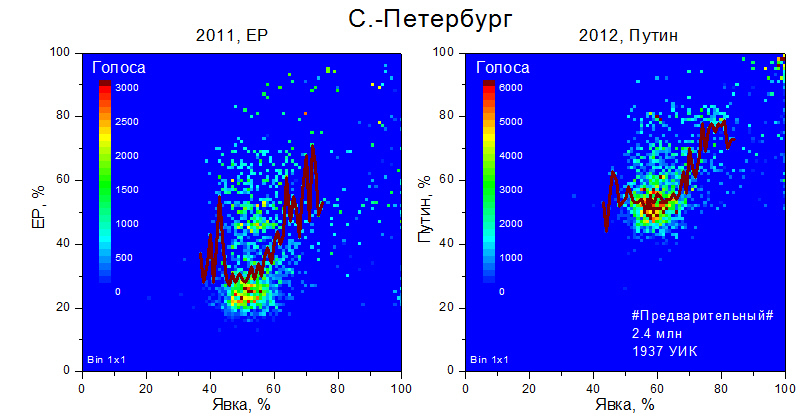 There appears to be little difference between 2011 and 2012; if anything, this year there were quite a few stations with close to 100% turnout and 100% pro-Putin votes, as shown by the cluster to the top right. There is also a second cluster at a turnout of 60% and pro-Putin vote of 80%; there, too, are falsifications beyond doubt, as they are all concentrated in just two Territorial Electoral Commissions and 32 identifiable polling stations. Beyond those two patently false clusters, the spread too is very suspicious, contrasting as it does with Moscow’s elegant oval. Again from the same source, the 2011 and 2012 elections visually compared. 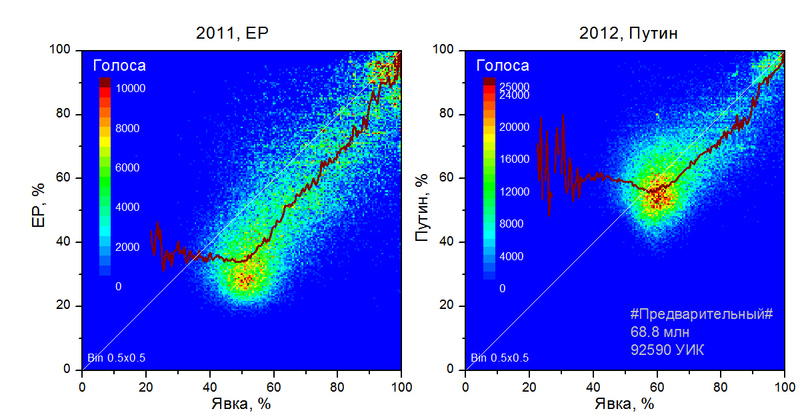 As I argued in my epic post on statistical methods for detecting fraud, a positive correlation between turnout and votes for Putin, or United Russia, is not necessarily indicative of fraud (First, different socio-economic subgroups are known to have different electoral patterns in Russia under fair elections, e.g. rural areas have higher turnouts, higher votes for incumbents, and bigger spreads; Second, if this correlation were proof of fraud, one must then also conclude elections in Israel, Germany, and the UK are falsified too). 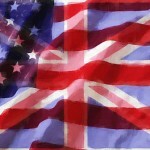 Nonetheless, they are useful in the sense that they can be compared from one year to the next. And as we can see above, overall 2011 seems to have been substantially more fraudulent; in particular, the unnatural cluster near the 100%/100% mark is both bigger and darker (i.e. denser) in 2011 than in 2012. Furthermore, the center of the huge circle in 2012 – largely representing results from the ethnic Russian urban areas – is unambiguously above the 50% mark, at about the 55% point, compared to the official result of 64.6% (difference: 10%), which means that Putin definitely got enough votes to avoid a second round. In contrast, the center of that big circle was at around 30% in 2011, compared to the official result of 49.3% (difference: 20%). 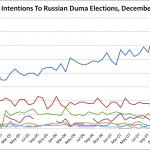 Though one cannot glean direct figures from this – again, urban ethnic Russians vote more uniformly and less enthusiastically for the establishment candidates – one can get a sense of the relative scale of fraud, and this back of the envelope calculation implies that overall fraud perhaps nearly halved in 2012 compared to 2011. As fraud was 5%-7% in 2011, with an absolute reasonable upper limit of 10%, this constitutes further support for my estimate that it was close to 3%-4% this time round. Number of votes vertically, result for each candidate horizontally. Putin is dark red, Zyuganov is red, Prokhorov is green. 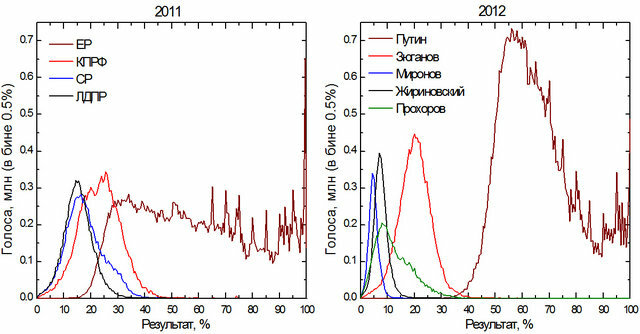 Prokhorov has an interesting bimodal distribution, because of the influence of subgroups: The bulk of the Russian electorate (first peak), then the urban metropolises of Moscow and St.-Petersburg (second bump). Part of the “long tail” of Putin’s and United Russia’s results are because of fraud, however part of them are also the innocent result of, again, subgroup voting patterns, namely that of rural voters among whom turnout and support for Putin are both higher than in the urban areas. Number of votes vertically, level of turnout at which they got those votes horizontally. Putin is dark red, Zyuganov is red, Prokhorov is green. The above shows the turnout (horizontal) vs. the median vote for each party or candidate at that level of turnout. Anyway you look at it, all graphs would suggest aggregate falsification was less in 2012 than in 2011. The North Caucasus: Is It Fraud, Or A Communal Voting Culture? The most egregious discrepancies come from the Caucasus. Whereas the exit polling evidence does indicate that Putin has very high “true” support at 68.4% in the North Caucasus Federal District – when one discounts the ethnic Russian region of Krasnodar (where he got 65%) then perhaps as high as 75% for the Muslim republics, the official results – 90%+ in all the Muslim republics, including 99%+ in Chechnya – are nonetheless incredible. Kireev has a very interesting post on the mechanics of voting in Daghestan, where officially there was 91% turnout and a 93% share of votes for Putin. An observer watched one polling station via the http://webvybory2012.ru/ website, and as the station was equipped with a voting machine, it allowed him to calculate both the correct turnout and share of votes for Putin (i.e. by excluding the people throwing in more than one ballot). The results of those who voted fairly, with turnout at just 36.3% with Putin getting 60.3% and Zyuganov getting 28.1%, differed substantially from the official tally of 94.3% turnout with 84.7% votes for Putin and 10.8% for Zyuganov. Of the non-standard voters, there were many people who turned up there with 2 or 3 bulletins, i.e. they were not “mass” ballot stuffers. The possibility exists that they were simply voting for absent family members, and as such that not all the “stuffed” votes in this category were for Putin. Then there were a few people who came in with big packs of bulletins, who really did fit the characteristic of ballot stuffers. In their case however, my pet theory is that it may not be quite so much a case of nefarious fraud as a reflection of Daghestan’s and the North Caucasus ethnic republics’ voting cultures; namely, the practice of voting not by individuals but by teips, i.e. the clans that form the heart of Chechen, Ingush, and Daghestani society. The teip decides on a single candidate for the teip to support; Putin would get the nomination in almost every case (after all, the exit poll shows ordinary Daghestanis giving him twice as much support as the next nearest candidate, Zyuganov); and the headman would send a representative to vote for Putin on behalf of everyone in the teip. The “non-stuffed” result in that station, with 36% turnout with 60% voting for Putin, may then represent the true “representative” feeling of urban Daghestani society, as expressed by its urban residents that are not closely affiliated to a teip. The other part of Daghestani society works on communal principles, that if you think about it actually – de facto if not de jure (because the practice is formally illegal under Russian law) – resemble the winner takes all “first past the post” system in the UK. That said, I stress that this is a theory, an alternate way of looking at the voting in places like Daghestan, Ingushetia, Kabardino-Balkaria and Adygea that shines a slightly more positive light than the standard interpretation that their elections are marred by huge fraud; it is not fact. The possibility that communal voting is an accepted electoral practice in those regions is further supported by the presence of a similar phenomenon in local elections in Arab villages in Israel. The topic needs further research.